The Hockey Show is proud to present a fellow blogger to the show today as we welcome Jeff Barak from the Third String Goalie site to the show! 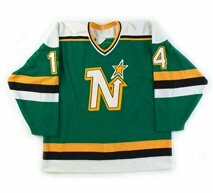 Jeff does great work in finding old hockey jerseys and stories and posting them on his site where he imparts some incredible information about the person who wore the sweater or was responsible for some major revelation in hockey history. Needless to say, Third String Goalie is a favorite site of mine, and I stop by quite regularly to see what Jeff has found. 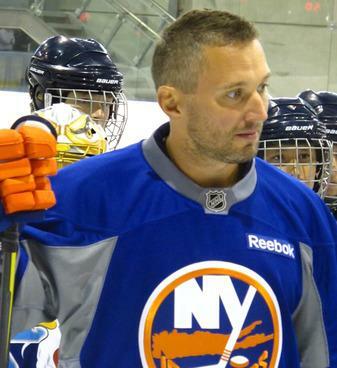 One of the best things about knowing Jeff is his passion for the game of hockey itself. He lives in Minnesota, meaning he lives, eats, breathes, and sleeps hockey. He's a passionate Minnesota Wild fan. He loves watching the NCAA's Golden Gophers dismantle the rest of collegiate hockey. His knowledge and love of hockey history is phenomenal, and I am happy to call him a friend. In short, Jeff is a die-hard hockey fan, and I believe that will show in the interview tonight. The man knows his puck. 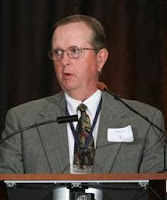 We'll be talking to Jeff about the NHL, the loss of the North Stars, the rise of the Dallas Stars as Stanley Cup champions, the return of NHL hockey to Minnesota in the Wild, Gopher hockey and a possible run in the Frozen Four this season, and, of course, hockey sweaters. If you have questions you'd like to ask Jeff, I encourage you to tweet them to me at @TeebzHBIC or email them in at HockeyShowUMFM@shaw.ca. We're going to squeeze as many questions into our half hour as possible, so join us tonight at 6PM on 101.5 UMFM to hear Jeff Barak of the Third String Goalie site give us the low-down on his view of the hockey world! I've spoken a little about the California Golden Seals and Oakland Seals before on this soapbox. Hockey history, particularily from this point in time, is quite fascinating with all of the changes, movement, and upheaval of franchises that were seen within both the NHL and WHA. The hardest part is finding images and highlights of the old games to confirm findings. However, several users on YouTube are now putting up incredible highlights and news clips regarding these old teams. Today, we'll take a look at an incredible piece put up about the Seals franchise that highlights the entire existence of the club. Credit for this clip goes to "werqa123" as he posted the clip on YouTube. Greg Musselman, who was an anchor and Sports Director for ITV Edmonton from 1981-96, filed the following report, and some of the images and facts contained within his story are pretty incredible. There was no mention of why the Seals were changed to green-and-gold, but everyone assumes that it was due to Finley owning the Oakland Athletics. The Seals officially wore "kelly green, California gold and 'polar bear' white" if you asked Finley. Finley, of course, changed MLB's Athletics to a green-and-gold team with white shoes. For a long time, Finley has stated that the color combination of green and gold was his favorite. However, the June 30, 1970 edition of the Vancouver Sun quoted Finley as saying, "My two daughters are redheads and my wife has dressed them in green and gold since they were born. It'll be the same in hockey." So if that's the case, he dressed his teams in the same colors as his daughters. 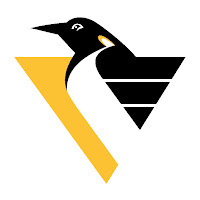 The white skates, which look like figure skates in this image, are now more easily explainable when you consider that Finley was modeling his team's look after his wife's and daughters' fashion choices. 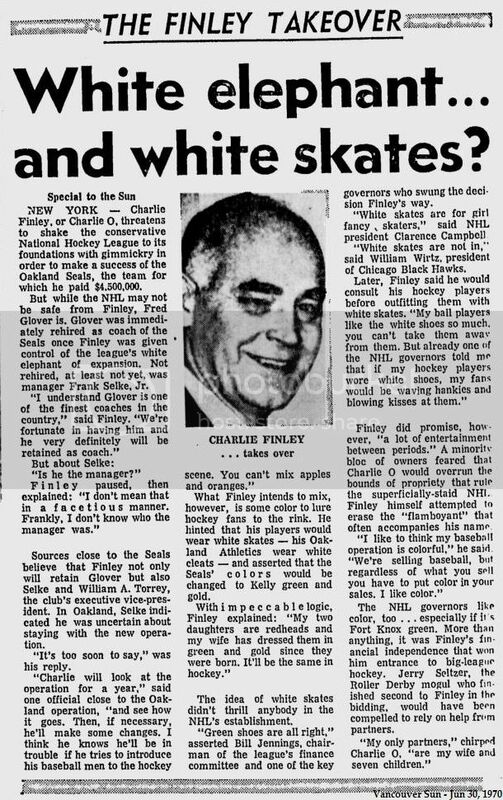 For the longest time, it was thought that the players on the Seals had their skates painted white, but Musselman reports that owner Charlie Finley actually bought the team white skates! Of course, there was a backlash from the other owners and, in particular, NHL president Clarence Campbell who is quoted in the Vancouver Sun article as saying, "White skates are for girl fancy skaters." Marshall Johnston fondly recalls the ridicule the Seals took in their white skates to Evan Weiner of NHL.com. "Back then, I wasn't a physical player anyway, but I remember in Boston one night and some guy hollers over, 'Hey Johnston where's your purse?" he said with a laugh. "But that part of it. It was kind of fun." Terry Murray wore the white skates in 1972-73, and he elaborates on the painting of the skates in an interview with Evan Weiner. "Well, the white skates, they got heavier every week, too," Murray told Weiner. "It was just shoe polish and the trainers had to make sure they were white every game and they just got the old white polish out with the applicator and kept piling it out. So it was an extra five pounds by the middle of the season. "I don't think we felt good about (wearing the skates), I think we always felt like a little bit of a pansy; maybe the only thing that helped out was that the Oakland A's were playing World Series ball and championship ball at that time and they had the white cleats on. Maybe it helped in our minds a little bit seeing them out there." Pretty interesting, right? We have two teams in the "Big Four" pro leagues dressed as his daughters were dressed, and the white skates were covered in coats and coats of shoe polish. While it wasn't truly paint per se, Terry Murray made it pretty clear that the skates got heavier and heavier as the season progressed. The legend of the Seals' white skates, as well as why they were changed to green and gold, now have a little more weight to them thanks to Mr. Musselman's excellent piece and a little research. Isn't hockey history great? It's even better when you learn that Terry Murray kept his white skates! If you're a regular reader of Uni Watch, you're most likely aware that writer Paul Lukas hates the color purple. If you're not reading Uni Watch, I suggest you start doing that. In any case, the AHL's Binghamton Senators announced that they will be holding a Power of Purple Night on February 10, 2013 when they play the Albany Devils. You're probably thinking that Binghamton will be wearing purple jerseys, and you're probably right. But this promotional game is about so much more. Luke Richardson, a former NHL defenceman, was an assistant coach with the Ottawa Senators in 2010 when his daughter, 14 year-old Daron Richardson, committed suicide on November 13, 2010. The death of Daron was a shock to the Richardsons, the Senators, the community, and the city of Ottawa. Her suicide prompted many schools and groups to band together and wear purple in memory of Daron and her struggle with her mental health. Purple was chosen as it was Daron's favorite color. On February 2, 2011, the Richardsons took action to try and help other teens and parents cope with mental health issues by launching Do It For Daron. Along with the Royal Ottawa Foundation for Mental Health, the Sens Foundation, and the Ottawa Senators, the Do It For Daron Foundation was launched to honor Daron's life. On every February 8 - Daron's birthday - the Do It For Daron Foundation encourages groups and businesses to promote purple in order to raise awareness and show support for any and all young people "who suffer in silence from the pain and stigma of mental illness". This season, with Luke Richardson coaching the Binghamton Senators, the Senators will lend their support to the Do It For Daron efforts. This is a really classy act by the Senators to stand by Luke Richardson and show their support of him, his family, and the charitable organization he runs. On February 10, fan will be encouraged to wear purple to the rink. 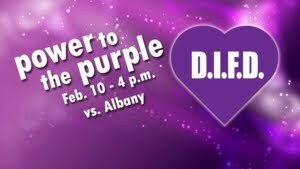 The first 1,750 fans to make it down to the rink that night will receive a purple D.I.F.D. rally towel to help cheer on the Senators. Both teams will wear special purple warm-up jerseys before the game, and all Senators players will wear Do It For Daron purple heart stickers on their helmets and don purple laces in their skates. Of course, the Senators coaching staff will be dressed in purple as well. The best news is that the Mental Health Association of the Southern Tier (MHAST) will be on-hand at the game to provide information and professional support for those seeking it. Do It For Daron merchandise - bracelets, pins, t-shirts, mittens, toques and mental health kits - will be available for purchase that night, and MHAST will have a limited number of bracelets and t-shirts available. Perhaps the best news of the entire night is that all proceeds from the sale of Do It For Daron merchandise, the silent auction, and in-arena donations will go to the Mental Health Association of the Southern Tier in partnership with DIFD. $2 for all tickets sold for that night will also go to MHAST as well. I have to say that I cannot fathom how a teenager can consider suicide as an option, but it's very apparent that the mental health of teens should not be overlooked. Suicide is the second-leading cause of death among teenagers after car accidents. While the quantity of suicides is low among teens, the fact that it is the second-leading cause of death says that the demons some teens face are very real. I commend and applaud the Binghamton Senators for helping the Richardsons cope with the loss of their daughter, and for standing behind them in trying to bring further awareness about mental illness in teens. This is a classy move by the organization, and I'd be proud to wear purple on this occasion. It may be a regal color, but it will look great on a number of Senators on this night. While the title of the article could have been used for a CBA-related article, the sad reality is that one hockey team's season is over due to money. I've been following the Dalhousie women's hockey team's story where the team was suspended due to an alleged hazing incident that happened. At first, I had been against the women because of the stigma that the word "hazing" carries. However, after reading about what the women say happened at the party and working towards a plan for restorative justice, my favor swung towards the women in that the punishment did not fit the crime. It appears that the threat of legal action by the women's team against the university - a drastic last step in restoring their season - will not happen now because of one thing: money. Taking a case to court costs a bundle of money, and, having been a student myself, students don't have bundles of money to spend on things like court cases when classes and books are a priority. In an interview with CTV Atlantic, players Isabelle Germain and Laura Brooks stated that they would not be pushing forward with the legal option due to the costs associated with the case. While I totally understand their reasons for not pushing forward, I'm surprised that no one from the legal community has stepped forward to allow these young women to play. While Miss Germain states in the interview that Dalhousie University has unlimited resources in terms of being a reputable law school, there are probably a pile of lawyers who would do this type of work pro bono. The only problem I see is that a vast number of lawyers in and around the Dalhousie University area, and the rest of Nova Scotia for that matter, are Dalhousie law school graduates. Biting the hand that once fed these graduates probably isn't such a smart thing to do. Especially when the reputation of being a Dalhousie law school graduate is held in high esteem. Both Miss Germain and Miss Brooks indicated that they would pursue a spot on the team next season, and that neither hold the school in a negative light. I commend both players for finding the silver lining on a dark, ugly cloud passing by this season. This speaks volumes to the character of the players on this team, and while I assume some will hold resentment over the forfeiture of the season, the fact that the players have chosen to take the high road speaks more about how much of a family they are than anything else they have done during this process. They accepted responsibility, they admitted they partied, they looked for a reasonable agreement with the university and found none, and they still took the high road when all other paths led to dead ends. This type of character speaks volumes in the real world and with me. So while the buck stopped this court case from proceeding, the women will pursue the university in order to have them clarify policies so that nothing like this can happen again. The women will ensure that parties like theirs that landed them in trouble do not occur again for any of Dalhousie's teams. Again, that's a show of character that you wouldn't expect from a group of disappointed, wronged young adults in a case like this whether they are innocent or guilty regarding the alleged charge of hazing brought against them. Dalhousie University has every right to uphold their policies, as ambiguous as they appear to be, in any way they see fit. They made the rules, so they can uphold them even if it seems that they are doing so in an unfair fashion. The women that represented Dalhousie women's hockey team, though, are winners in my book regardless of how this season played out or what their record showed. They have shown incredible patience and stoicism in the face of being accused of something quite serious, and have tried to find reasonable and compassionate solutions to not only erase the stigma attached to their names and team, but to the school and its community as well. When the school decided to not change their stance, the ladies have since pushed on and are now doing the right thing in taking the high road in showing their strong characters. Hearing the end of this story in terms of how this whole thing played out, the Dalhousie women's hockey team reminds me of Charlie Simms in Scent of a Woman. The women are seemingly doing the right thing, albeit opposite of Charlie in speaking out, and it seems that headmaster Mr. Trask - President Tom Traves of Dalhousie - is trying to identify them as the guilty party. I don't know if Charlie's silence here today is right or wrong. I'm not a judge or jury, but I can tell you this: He won't sell anybody out to buy his future! And that, my friends, is called integrity. That's called courage. Now that's the stuff leaders should be made of. Now I have come to the crossroads in my life. I always knew what the right path was. Without exception, I knew. But I never took it. You know why? It was too damn hard. Now here's Charlie. He's come to the crossroads. He has chosen a path. It's the right path. It's a path made of principle that leads to character. Let him continue on his journey. You hold this boy's future in your hands, committee. It's a valuable future. Believe me. Don't destroy it. Protect it. Embrace it. It's gonna make you proud one day, I promise you. I took the liberty of bolding a number of words and phrases: integrity, courage, right path, principle, character, valuable future, gonna make you proud. All of these words and phrases apply to the women on the Dalhousie women's hockey team regardless of what they are alleged in doing because they came to the crossroads, they admitted they may have been wrong at face value, and are asking for transparency at this point. Until Dalhousie University can produce their evidence that finds the women guilty of hazing outside of what they have admitted to, one must be held innocent until proven guilty in virtually all societies. If this is all the evidence they have, noting that they have maintained there IS additional evidence, innocent until proven guilty. It's quite simple. Being that Dalhousie University is a public institution, those investigations done should be of public domain. After all, as per Wikipedia, "All major Canadian universities are now publicly funded but maintain institutional autonomy, with the ability to decide on admission, tuition and governance." Meanwhile, all lawyers, and certainly those from Dalhousie's school of law, are taught that "the burden of proof lies with who declares, not who denies" (from the Latin, Ei incumbit probatio qui dicit, non qui negat). In this case, there has been no evidence presented by anyone from Dalhousie University to warrant the forfeiture of a hockey season and the suspension of 19 players in an alleged hazing incident. Like Pacino said, "I'm not a judge or jury", but I'm siding with the women in the court of public opinion. It's just a shame that these women won't be able to challenge the punitive action taken against them in a court of law because of money and power. I wish the women of the Dalhousie hockey team all the best in their studies this year, and I hope those players returning next year come back with the passion and drive necessary to do big things on the ice. I'm not comfortable or happy with how the process played out for these women, but Dalhousie University is doing what they deem as being fair and just. I just wasn't aware that a publicly-funded institution in a democratic society was a dictatorship. 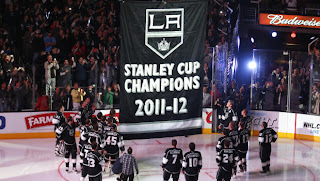 We finally got to see the banner raised at Staples Center for the Los Angeles Kings' Stanley Cup victory last season. A lot of time has past since then, we've seen an ugly labor war finally rectified, and everyone is back to work officially starting today. As "Badger" Bob Johnson used to say, it's a great day for hockey! 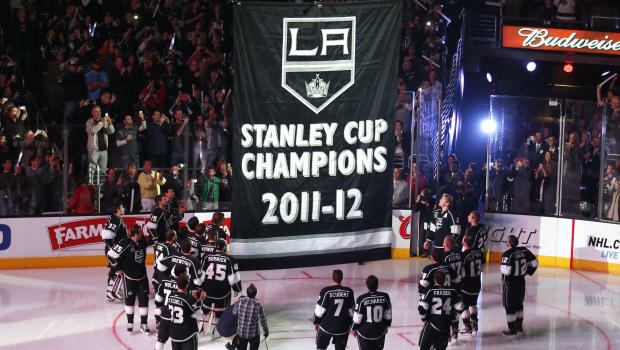 Once the excitement of seeing the banner hit the rafters died down, the Kings promptly began their defence of the Stanley Cup by completely rolling over for the Chicago Blackhawks. Nothing says "we are the defending champions" like giving up three first-period goals and looking entirely unorganized on the ice. While the rest of the game was a 2-2 draw, the damage was done early on as the Blackhawks took the game 5-2. If you were wondering, the first goal of the shortened 2013 season was scored by Patrick Kane on the powerplay from Marian Hossa just 3:41 into the first period. I'm not sure if that will be useful for any trivia buffs out there, but that was the first goal scored this season. We all heard about how great the goaltending tandem was in Vancouver this season with Cory Schneider being ready to accept the starter's role and Roberto Luongo being prepared to defend his stater's role with the Canucks. Instead, we saw the oldest player in the NHL this season - 42 year-old Teemu Selanne - pile up four points against the two goaltenders. Anaheim pumped four second-period goals past the two Canucks netminders en route to a 7-3 win over last season's President Trophy winners. Selanne had two goals and two assists in the win, and he looked like he was ten years younger than he is. Schneider, who played in Switzerland during the lockout, looked like he hadn't skated for a while, and Luongo was only marginally better. While the goaltending wasn't great for Vancouver, the penalty kill was absolutely abysmal. Anaheim went three-for-three with the man-advantage, leaving Vancouver with a penalty killing percentage of 0% after one game. Anaheim was the 21st-best team on the powerplay last season, and it's not like they brought in a ton of talent to revamp their offence. Vancouver laid an egg on Saturday night, and Teemu Selanne took advantage. Speaking of old men lighting up the ice, Jaromir Jagr carried over his Czech Republic scoring pace in Dallas as the Stars downed the Coyotes by a 4-3 score. Jagr was in on all four Dallas goals, and helped to set up another old man as Ray Whitney scored a powerplay goal in his Stars debut. Jagr, who is 40 years old this season, looked like he was in his mid-twenties in this game, connecting nearly-impossible passes to teammates and skating with determination again. I didn't see the game, but the highlights made Jagr look like he's playing for a Stanley Cup in Dallas this season. If he can continue to rack up points like he did tonight, Dallas had a great shot at making the playoffs this season. Despite the loss, Radim Vrbata is back to his old Phoenix ways again. He's never scored more than 18 goals for any team he has played with other than Phoenix. In the Arizona desert, Vrbata has never scored less than 19 goals in a season. I'm not saying that there's any correlation between Vrbata and Phoenix, but he might be out of a job if the Coyotes were to ever move. He scored a pair against Dallas tonight, giving him 107 of his 185 career goals in a Coyotes uniform. Or, more succinctly, 57.8% of his career goals have come in four seasons in Phoenix. Did anyone see Detroit struggling like they did against the Blues? I understand that Nicklas Lidstrom was a Hall-of-Fame defenceman, but the Red Wings looked all kinds of lost on the ice against St. Louis today. The result? A 6-0 loss to start the season. St. Louis outshot Detroit 17-2 in the first period. Yes, that's not a misprint. The final tally saw St. Louis throw up a Detroit-like 36-14 margin in shots. For all the weapons that people talk about in Detroit - Datsyuk, Brunner, Zetterberg, Franzen - all St. Louis did was throw a blanket on them. Brunner and Filppula led the Wings with three shots each, but St. Louis was simply awesome in their opening night effort. St. Louis' Vladimir Tarasenko looks like he's going to make a case for the Calder Trophy as he scored a pair of gorgeous goals against the Wings. He skates like wind, has incredibly soft hands, and sees the ice very well in terms of finding a spot to turn a pass into a goal. Keep your eyes on this Russian whiz kid. He looked impressive in his NHL debut. Lastly, it looked like all systems go in Winnipeg where the Jets used a huge push from the crowd to jump out with some excitement and emotion. An early penalty resulted in a Dustin Byfuglien powerplay goal, and it appeared that the Jets were off and running in this sprint-like season. The problem? These are still the Winnipeg Jets. After that powerplay marker, it appeared as though the Jets took their foot off the gas pedal. Or perhaps Ottawa woke up and began to push. In any case, the Jets were outhustled, outworked, and generally outclassed in their own barn once again by this Senators team. Ottawa has now won three straight games, including a key one down the stretch last season, at MTS Centre and appear to be making the Winnipeg arena into their second favorite home with their 4-1 win today. The good news for Winnipeg after dropping the season opener for the season year in a row is that they are in the same place as Washington and Carolina right now. The bad news for Winnipeg is they are in the exact spot where all the prognosticators said they would be at the end of the season. Winnipeg started strong, but it went downhill from there. They need to find a way to play for the entire sixty minutes every night or this season will be a long one for Jets fans. It was a great day for hockey, kids. Here's to the next 98 days being just as good! Today's entry will just be a quick entry as we get ready for the first games in the NHL season on Saturday. I know I said I wouldn't support the NHL as much, but I do miss hockey on Saturday nights - and a pile of other nights - because, well, most TV programming is pretty horrible. That being said, I have received some pretty interesting emails as of late, and I wanted to skim through those so that you have an idea of what's happening in other parts of the hockey spectrum because the NHL is great, but it's not the be-all and end-all. I'm also very excited about the guest who will be appearing on The Hockey Show tomorrow, so stay tuned to the end of this article in order to read a little about this fascinating guest! The ECHL's Orlando Solar Bears - still one of my all-time favorite hockey team names - is going pink for their games on January 17 and 19! The Solar Bears will don pink jerseys and help to raise money for cancer research and cancer initiatives by auctioning off these glorious threads! I can't really criticize the Solar Bears for wearing pink if they are donating money to cancer initiatives, and I think that the community involvement shown by the Solar Bears in their return to pro hockey has been outstanding. Well done, Solar Bears, and thumbs-up from me! 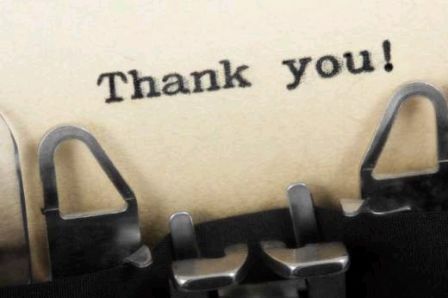 I received an email from a kind lady by the name of Pati. Pati works in the legal industry, and she wanted to know if I would give my blessing for her to use an article of mine at a ceremony. Curious as I was, I had to know what type of ceremony she wanted my work for considering I'm not the best wordsmith despite my best efforts. She responded by informing me that the man to the right - The Honorable Redfield T. Baum - is retiring from his role as a judge in Phoenix, and that they wanted to use my article for a poster that will be presented to Judge Baum about his time dwelling over the Phoenix Coyotes saga! While I'm not overly impressed with my writing in the article about Judge Baum's decision on the Coyotes, I am thoroughly honored that someone wants to use my work and I wish all the best in your retirement, Judge Baum! May good fortunes and great weather find you always in your next adventures! If you haven't seen it yet, you're probably not using Google as your search engine. Today's Google page features a fun Zamboni game in honor of Frank Zamboni's birthday! Mr. Zamboni passed away on July 27, 1988, but his link to ice hockey is anything but normal. In 1927, Frank and his younger brother Lawrence entered the block ice business by adding an ice-making plant to his supply shop. They ran their ice-making venture until 1939 when electrical refrigeration units began making their way into everyday life. With their experience in making ice, Frank, Lawrence, and a cousin opened a new ice rink, called the Iceland rink, near to their homes in Hynes, California. The popularity of this rink was immediate as Frank Zamboni had devised a way to prevent rippling in the ice. In 1949, he came up with his finest invention: a machine that could replace the laborious three-man resurfacing crew that cut ice resurfacing from 90 minutes to a mere ten minutes. Originally built on top of Jeep CJ-3Bs, the Zamboni has evolved and been redesigned over the years. The 10,000th Zamboni ice resurfacing machine prouduced is still in use today at Montreal's Bell Centre, and the company is still operated by Frank's family. Pretty cool, right? Well, if you want to play the Zamboni Google Doodle Game, it's linked up right here and waiting for you. The Google Doodles site has a ton of interactive doodles that you can look through and interact with, so I suggest taking some time and checking out all of this amazing work done by Google. 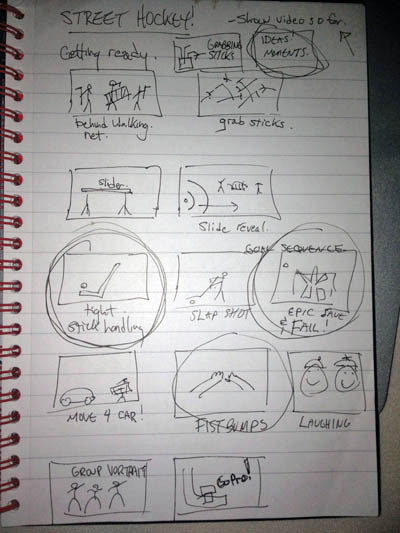 Some of may favorites include the Star Trek Doodle, Les Paul's Doodle (where you can record your music), Robert Moog's Doodle (again, recordable), and the Charlie Chaplin Doodle (Google's first live-action Doodle). 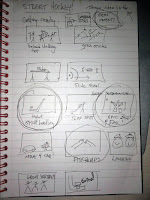 Enjoy these doodles, find some other good ones, and even kick back and enjoy a game of PacMan! Finally, we welcome our first female guest who, like Frank Zamboni above, has an interesting story about how she got involved with hockey, specifically an OHL team! We'll be chatting with her tomorrow about her work with the OHL's Kingston Frontenacs, and how she turned a passion into a full-time job! Tune into The Hockey Show tomorrow night at 6:00PM CT on 101.5 UMFM and we'll chat with the Frontenacs' Social Media Coordinator Missy Deyo! If there's one thing about a short, intense camp where players are jockeying for te few open roster positions, it's that injuries can and will happen as players look to go the extra mile in making the team. There were a pile of reports out of camps today as players began feeling the tweaks and strains of intense camp workouts. And some teams have lost key players in these scrimmages and drills, making the job on the rest of the team a little harder when the season opens on Saturday. With Ryan Kesler on the shelf already after having his wrist and shoulder operated on in the off-season, potential linemate David Booth joined him in the Canucks' infirmary. It was confirmed today that Booth has a groin strain and will miss 4-6 weeks while he rehabs the injury. Stepping up in Kesler's and Booth's places are Andrew Ebbett and Zack Kassian, but may be a far cry from what Kesler and Booth normally bring to the table in terms of talent. 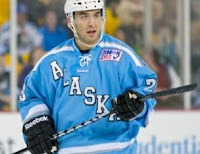 Chris Higgins may get some time on that line, and he's proven he can fill the net at the NHL level. Either way, though, the Canucks have found themselves two-thirds of a line down and we haven't even broken camp yet! It sounds as though Winnipeg will be without a solid defensive forward as Antti Miettinen will miss at least the season opener against the Ottawa Senators with the mysterious "upper-body injury". Head coach Claude Noel confirmed the injury. "He's going to be out indefinitely. We're doing some further testing on some things on him to assess the situation. It's not day to day. He won't be a player for Saturday." While Miettinen isn't relied upon for scoring like Booth and Kesler are in Vancouver, he's a valuable penalty killer and a solid defensive player - something the Jets can definitely use. If Miettinen's injury is serious, could this be the break that Mark Scheifele needs to stay in Winnipeg all year? The Calgary Flames have yet to see Jarome Iginla in high-intensity practices as he recovers from a groin injury. While the Flames insist that the exclusion of Iginla is "precautionary", you have to believe that the Flames are going to keep him out of practices until his groin is 100% ready. The Flames open their season on Sunday, and everyone in the Flames organization has been saying Iginla will suit up for their game, forward Roman Cervenka is going to be sitting until his serious medical condition - blot clots in his leg - is cleared by a hematology specialist. Boston forward Marc Savard returned to the injured reserve list after being found medically unfit to play at this point in the season. I can't imagine how hard it is for Savard to be stuck on the sidelines, but I am very glad he isn't being put back in the line of fire after having his brain scrambled a few times. Savard's long-term health is far more important than a 48-game NHL season, so here's hoping the extra time off will help his head become less foggy. Here's hoping Marc Savard will look at the future and realize that hockey isn't worth potentially ruining his life. Stay on the sidelines, Marc, and get your head right. With speculation confirmed today that Flyers forward Claude Giroux will be named captain in the coming days, that should pretty much close the book on Chris Pronger returning from his concussion problems. If this is truly the end of Pronger's career, I can assure it's not the way he wanted to go out, but, like Savard above, his long-term health is far more important than suiting up for one more game. If anyone in or around the Flyers organization can speak volumes about this, Pronger should be asking Keith Primeau. In any case, I hope the big defenceman can recover, but I'd rather see him healthy and happy than suffering a lifetime of pain. The Stanley Cup champion Los Angeles Kings will be without Anze Kopitar for what appears to be a couple of weeks as he recovers from a knee injury. Missing Kopitar will be a large part of their offence on the sidelines, but the Kings may benefit from an earlier return if Kopitar's schedule works out. Either way, the Kings need all the offence they can find if they play like they did last season, and Kopitar is a large part of that offence. Needless to say, there are some important players on the mend right now, and opening night might be missing a few of the league's brightest stars as they work through their injury troubles. Short camps and short seasons mean that we could see a spike in injuries this season. Let's hope that the stars remain healthy to ensure the fans come back.